Almonds are as healthy as a nut can get! Choc-a-bloc with essential nutrients, almonds make for a nutty, delicious and nutritious snack. Add them in lentils or stir-fries, or eat them with honey, or sprinkle some over a bowl of dessert. Let’s look at the almonds health facts as well as the almonds nutritional value. Almonds are a good source of dietary fiber as well as protein, which makes it a great food for calorie control. While, several foods are excellent sources of one of the components, almonds contain both, protein and fiber. Almonds have monosaturated fats, which can help in reducing the level of LDL cholesterol. Research shows that an ounce of almonds a day can lower the harmful affects of cholesterol. Almonds are packed with minerals that do a world of good for bone health. Rich in phosphorus, manganese, magnesium and calcium, these minerals maintain bone density. Including almonds in our daily diets is a good idea because of the health benefits – from essential minerals to absorbable protein, almonds are a nutrient-rich diet. Almond is a good source of vitamin E. Vitamin E is an antioxidant, which can reduce the chances of cataract, cardiac diseases and cancers. Vitamin E is also good for building healthy tissues and blood cells. Oil of Vitamin E can also apply on skin to get good skin. Benefits of vitamin E oil include rejuvenation and increased growth of new cells on the skin. Almond nutrition includes folic acid or folate, a B-vitamin that can reduce the chances of birth defects in unborn babies and is also good for making red blood cells. Folate also protects the heart from cardiac problems like stroke and heart attacks. Almonds contain iron, which helps to carry oxygen to the organs and cells. The zinc in almonds helps to heal wounds and is good for the protein metabolism. It is believed that zinc is beneficial for the development of the reproductive system. The copper content in almonds can oxygenate the various parts of the body and can keep the nerves, blood vessels and bones healthy. Copper can reduce the chances of cardiac diseases. Magnesium in almonds is good for the bones, muscles and for maintaining the balance of potassium and calcium in the body. They also regulate the body temperature. Almonds are rich in phosphorous, which is important for building strong teeth and bones. It also helps the body process carbohydrates, fat and protein. Rich in phytochemicals, almonds can protect the body from cancer, heart diseases and other diseases. As they say, “all good things come in small packages” – a saying that fits the almond benefits to the fullest! • Stabilizing blood sugar: Normally, the levels of sugar in the blood tend to rise after eating high glycemic foods such as potatoes. However, eating almonds along with such foods controls the spike of blood sugar that occurs after eating carbs. • Improving skin tone: A massage with almond oil is often recommended by beauty experts, especially in the case of newborn babies. Almond milk is also used in many soaps and skin care products, as almond helps to improve skin complexion. In fact, almonds can also be made into a face scrub by soaking them in water overnight and then peeling and grinding them into a thick, rough paste in the morning. Fresh cream should be added to the ground almonds, to make an effective face scrub that exfoliates the skin and removes dead skin. • Pregnancy: Among other vitamins, almonds are also high in Folic Acid, which helps to reduce the chances of birth defects in babies. • Weight loss: Studies indicate that people who eat almonds regularly are at a lower risk for gaining weight, in spite of the fact that almonds are quite high in calories. Munching on almonds in lieu of unhealthy snacks can help reduce fat in the abdominal area thereby reducing the size of the waist. Moreover, because almonds are very high in fiber, protein and mono-saturated fat, they can help you feel full for a longer time. This is one of the most well known soaked almonds health benefits. 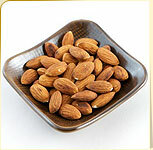 • Memory: Another one of the common soaked almonds health benefits is an enhancement of memory. Right from school children to senior citizens should consume at least 5 to 6 almonds every morning that have been soaked in water overnight. There are some people who eat almonds after plucking them straight off the tree, since it is believed that there are numerous health benefits of raw almonds. However, in some parts of the world, wild and raw almonds contain a glycoside that can be converted into the poison cyanide. Therefore, regardless of the raw almonds health benefits, wild almonds should always be roasted, before consumption. Moreover, an excess of anything can lead to problems and therefore it is advisable to consume no more than the daily recommended dose of almonds. Almonds are known to be an excellent source of vitamin E as well as other essential minerals such as potassium, zinc, magnesium, iron, fibre and healthy monounsaturated fat. One of the almond benefits is that is contains high amounts of calcium as compared to any other nuts and hence is an excellent option for vegetarians who do not consume any dairy products. One of the other almond health benefits is that it contains laetrile or amygdalin which is known to be an anti cancer nutrient. Almond benefits the heart as well as it contains plenty of phytochemicals which are known to be effective in lowering the levels of bad cholesterol and thereby preventing heart disease and instead keeping the heart healthy. Some of the other almond benefits are that it is an excellent source of protein and has almost no carbohydrate content which makes it an ideal food for pre diabetics, diabetics or anyone who has issues with their blood sugar levels. Almond also benefits the functioning of the brain as it is an essential source of plenty of nutrients that aid the development of the brain. In fact the consumption of almonds on a regular basis induces a higher than normal intellectual level and is hence considered by many as one of the essential foods for growing children. Almonds also benefit the heart by reducing the C reactive protein which is known to cause inflammation of teh arteries which would damage them and even lead to heart disease. Consumption of almonds is also known to reduce the risk of heart attacks. Almonds are also an excellent source of folic acid and are therefore advisable to consume as they reduce the levels of homocystein which would otherwise cause a build up of fatty plaque in ones arteries. One of the almond benefits for skin is that it helps in maintaining ones overall complexion and elasticity of the skin on account of the presence of vitamin E. Hence many mothers often massage their babies with almond oil. In fact almond milk is also added to some soap as it helps improve and beautify ones complexion. Almonds are also beneficial as they help in regulating blood pressure levels because of their low sodium content. One of the almond benefits for skin is that a regular massage with almond oil helps in preventing the appearance of premature wrinkles, blackheads, pimples and even dry skin. In fact almond oil is also used to treat black circles that may have developed around one’s eyes as almond oil tends to revitalize the cells that are fatigued and also improves the overall flow of blood. Almond oil also benefits the hair as it is known to be highly effective in treating untimely greying of hair, dandruff and even hair fall. Another one of the almond benefits is that the consumption of unsweetened almond milk helps ones in the reduction of weight over a period of time. This is because the monounsaturated fat present in almonds results in one feeling satiated for a longer period of time and thereby prevents overeating.